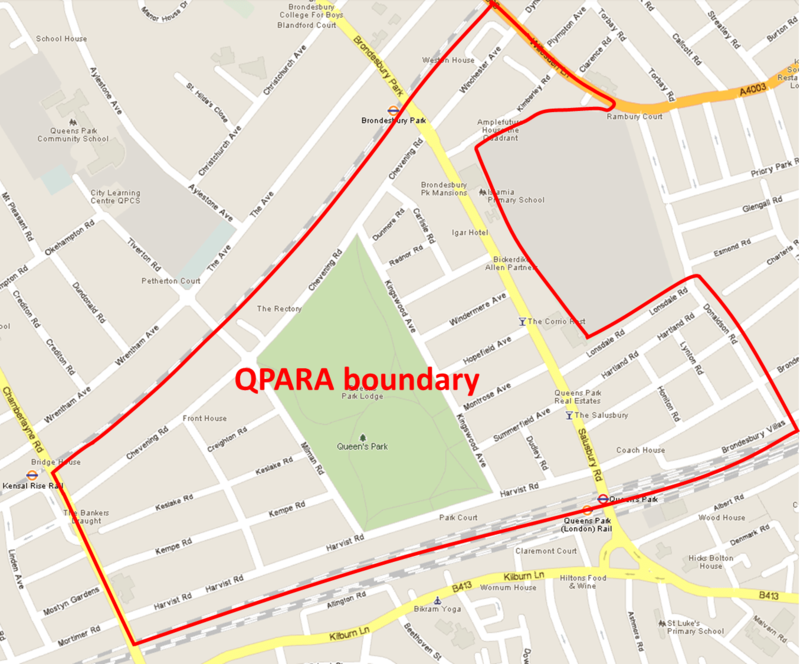 QPARA was established by local residents in 1973 as an entirely voluntary organisation keen to preserve the integrity of the conservation area … and that’s what we still do, but now so much more besides! Over the last few years QPARA has led and contributed to many initiatives that help our community on a daily basis. We keep this website up-to-date with news of our current activities and campaigns. Here’s the area we cover. Click on the map to enlarge it. If you’d like to show your support please think about joining as a member. Even if you live outside this area you can join us as an Associate member – you can’t vote meetings or be an officer, but other than that, you are a fully fledged member. Go to ‘Join us’ on the website menu for details of how to join. We encourage people to come to our monthly meetings which are held between 8.00 and 10.00pm at St Anne’s church, Salusbury Road, NW6. They are on the second Thursday of every month, except August. See ‘Monthly Meetings’ on the website menu for details of future meetings. Even if you can’t make it to meetings, you can support the Association in other ways. We always need volunteers to help with or organise the events we run, like Queen’s Park Day and Open Gardens. Another good way to get involved is through the Action Groups or affiliated organisations, such as the Queen’s Park Book Festival, Clean Air for Brent and Brent Patient Voice. There is more information on this website about the action groups – click on the menu for details. Contact us if you are interested in getting involved. If you would like to get in touch with your street rep, please contact Marika Szalanczi, the Membership Secretary, at szalanczi@hotmail.com.